Instant Banking by Citadel Commerce (www.citadelcommerce.com), first launched way back in 2000, making it one of the oldest and most trusted payment processing brands in the e-commerce industry. Like other online banking payment systems, it uses the same bank transferring technology as all large banks across the world. Due to this, you can use Instant Banking across twenty different countries and it supports over three hundred financial institutions. Since it is an online banking platform, the only thing you need is being above the age of eighteen. And that you have sufficient funds to make your merchant transaction. Instant Banking is not an e-wallet, so the account, if you choose to have one with Citadel, does not get pre-funded in any way. Unlike other online banking payment processors, Instant Banking does not keep a running track record of your transactions. Instead it directs you to check your bank statement for those. You also do not need an account to use their service in-so-long as your financial institution is supported. For Canadians looking to play at online casinos, this ends up being a safer way to fund your account. Rather than using your bank directly and possibly giving away sensitive information, go to Citadel’s website to encrypt and protect your banking information. Essentially by using this banking in-between, you are protecting your personal information from online casinos. Using Instant Banking is as easy as navigating to the merchant’s checkout and clicking on the Instant Banking button. You then proceed to your bank of choice, login and authorize the payment. There is NO account creation required at all. Which is a huge benefit for those who don’t want to go through the setup. This also makes it extremely fast for funding online casino accounts. As you don’t have to go through multiple login and registration processes just to transfer funds. Citadel Commerce supports all local currencies in noted supported countries. And if your currency is not accepted by the merchant, then the currency will be converted as required. All transactions are debited either instantly or within a 24-hour time period. You can find and see a history of your transactions by going to your own bank statement within your bank. This even works with online casinos that are perhaps in a different currency. For instance, Canadians who play at British casinos don’t have to worry about their currency not being accepted. Because it gets automatically exchanged. What makes Instant Banking stand out against other banking payment platforms is that all devices are supported as well as all browsers. Meaning you can use it from a PC or a Mac as well as from a smartphone or tablet. In addition to this, all funds that are sent to you from a merchant (say if you overpaid), then they will be automatically deposited into your bank. These reverse funds will also appear as an incoming transfer on your bank statement. All Canadians will be able to use Instant Banking from Citadel Commerce, in so long as they are with one of the five financial institutions that support casino gambling. If you are with one of the five major banks, you will not have any issues when depositing funds from your bank account through Citadel into your casino account. Royal Vegas, All Slots and Platinum Play are available for using Instant Banking. 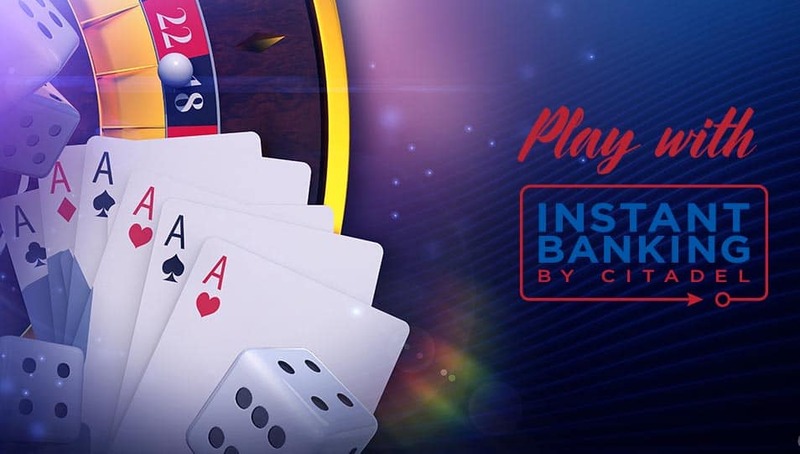 It is important to note though that some online casinos will only allow you to withdraw to the account you deposit with and Instant Banking is no exception to this rule. Take attention when using this option with Ruby Fortune, Betway or 888 Casino that don’t allow withdrawals with Citadel.